These days, I am traveling faster than I can write. The blog is woefully about 3-6 months behind my travels (I am really trying to shorten that). For now, one approach I am taking is to write a quick, summary trip report after each trip and then follow up with detailed posts later. This way, at least you know where I went in case you are planning a trip to the location. ANYWAY, I just came back from a week-long trip to Switzerland. Since it was a business trip, I did not spend my time optimizing my meals. Still, Geneva and Lausanne are lovely cities and I would highly recommend stopping by if you are in Europe. Here’s the trip report! 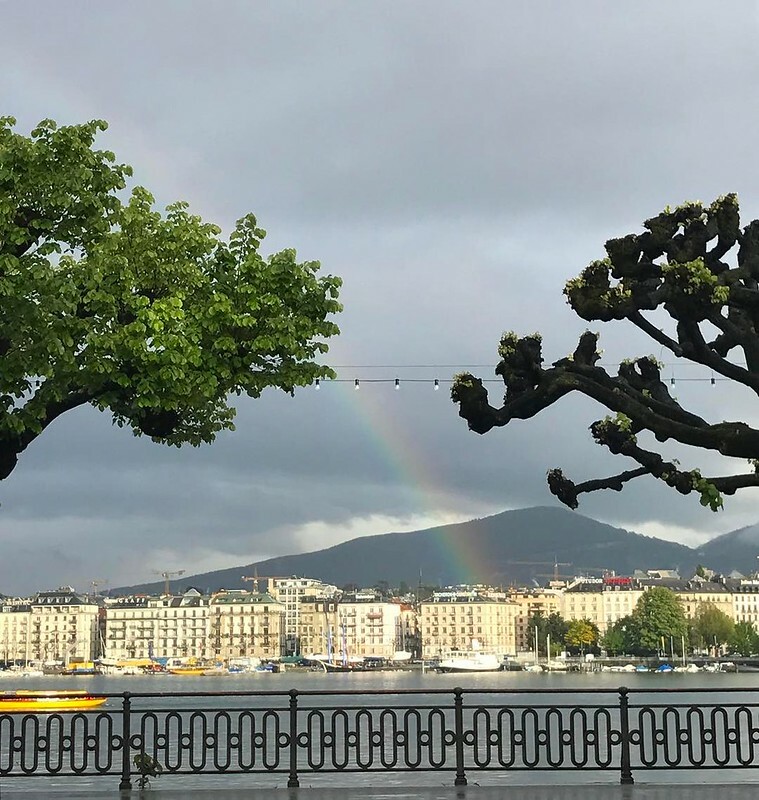 My first stop was Geneva, a lovely French-speaking city filled with quaint walkable neighborhoods, the stunning Lake Geneva, tons of great food, and (most importantly) fantastic chocolate. Lake Geneva anchors the city, and there are multiple bridges that crossing the lake. Many of the city’s luxury hotels and high end restaurants face the huge lake. I arrived around 2PM in the afternoon after an overnight flight from Boston. I’m not a good sleeper on airplanes, so I’m always a bit out of sorts after landing in Europe. Nevertheless, I vowed not to take a nap but instead decided to “power through” (as Bryan always advises) and walk around the city. It was raining most of the afternoon, but I was treated to a STUNNING surprise rainbow right around dinnertime. I was thrilled, and scrambled up a hill to snap multiple photos before showing up slightly late to my dinner reservation (but boy oh boy, was it worth it!). I dined solo at Le Jardin, a lovely restaurant on the first floor of Hotel Richmond, a highly regarded boutique hotel with gorgeous lake views. I sat next to the window and enjoyed peering out at the lake while the sun slowly set. The service was phenomenal (everyone speaks great English here), and they were really, really considerate of my solo dining status. At one point in the meal, the server even asked if I wanted a newspaper. The food was lovely and service was top notch. Of course, I was probably glowing all night from the rainbow sighting earlier in the day. After meetings in Geneva, we left for Lausanne. Lausanne is a smaller city about 45 minutes by car from Geneva. It is also situated on Lake Geneva, and the drive along Lake Geneva from Geneva to Lausanne is gorgeous. I was blown away by the stunning views of vineyards, rolling hills, and country life. It reminded me a bit of Napa, except with striking Swiss alps in the background. Lausanne is no less beautiful, and my jaw dropped when I saw the view from my hotel window. If only I had more time to enjoy this lovely balcony! I only had about an hour of free time in Lausanne, so I make a beeline to Chocolatier Blondel, a well known Swiss chocolate maker highly recommended by well-known food writer David Lebovitz. Bonus: French upscale bakery Laduree is right next door. We spent one last evening Geneva before flying back to Boston. I had a fantastic dinner at Le Chat Botte, a 1-Michelin starred restaurant located inside Hotel Beau-Rivage right on Lake Geneva. The food was excellent. We tried the 5-course “Earth and Sea” menu, a chef’s tasting menu that focused on seasonal vegetables and local seafood. It was phenomenal, and I will definitely write a more detailed post about that meal! Before landing in Boston, I was fortunate to have a stopover in Madrid. Of course I had to pick up some jamon iberico de Bellota (5J is still my favorite!) to enjoy on the airplane before arriving back in Boston. It was a great trip, but I’m happy to be back home in Boston. I’m finally getting over jet lag, and hopefully I’ll have a bit more time to catch up on all my other posts! Next up: our 7-day cruise of the fjords in Norway (plus some great new restaurants we’ve visited in Boston lately, including Les Sablons in Harvard Square and Terra in Eataly!). Still to come, my trips to London, Taiwan, and Japan! The chocolate shop was lovely and my jaw dropped when I saw the view .